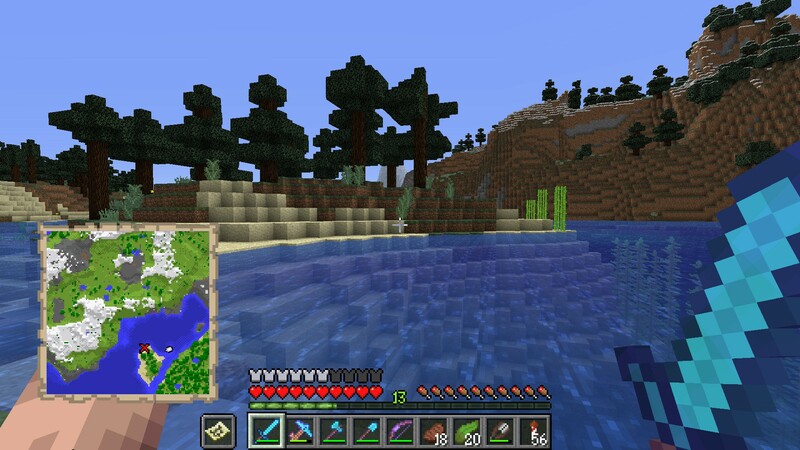 Minecraft 1.13 brought a variety of aquatic additions, as we all know - kelp, sea grass, sea pickles, coral, nautilus shells, and the trident-wielding drowned zombies. All of these can be farmed, and that's what Subacuatic Acuarium is for. 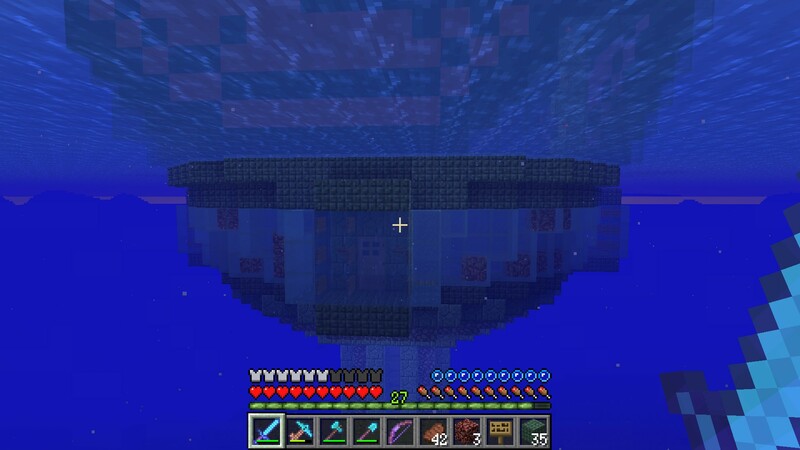 Or, at least, two projects under the Subacuatic banner will account for them all, even if nautilus shells are easier to obtain with an AFK fish farm that I can build absolutely anywhere in under five minutes. Originally, at least in the vision I had in my head, Subacuatic Acuarium would be a huge underwater (and probably underground, beneath the sea bed) facility to produce tridents and nautilus shells (along with a whole heap of other junk) by drowning zombies produced by a spawner in a dungeon, while there were separate smaller facilities to grow and automatically harvest kelp, and to produce sea grass and sea pickles using dispensed bone meal. 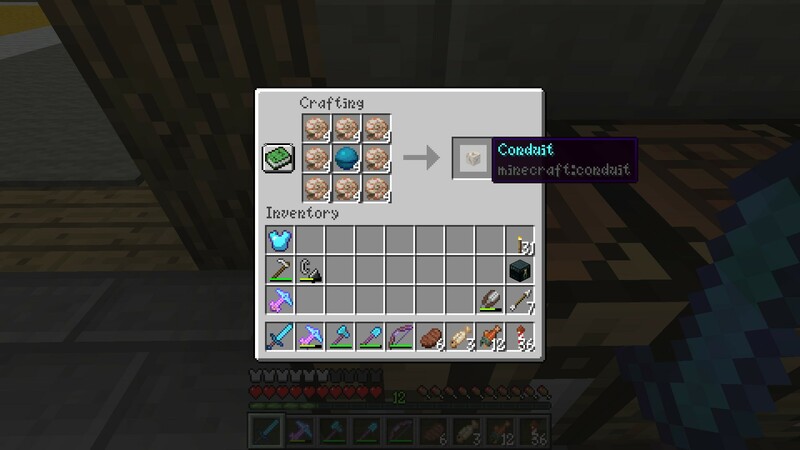 Coral was added to the list once its ability to grow via bone meal was added in a later snapshot, but unfortunately the zombie spawner design had to be canned when drowning land-based zombies no longer saw them magically generate tridents in their hands. 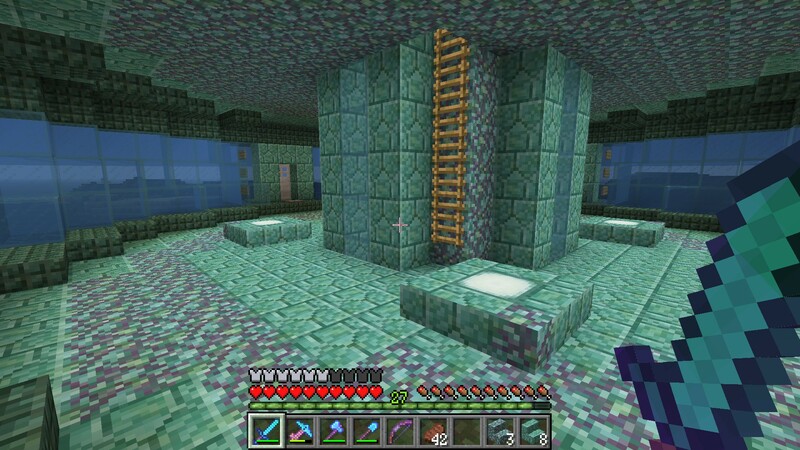 Fortunately, ilmango came to the rescue with a facility to attract drowned zombies from the sea bed - trident-chuckers and all - and hoover them up a long shaft to a collection area high in the sky. It would be the only safe way to produce a large number of tridents... and I could even decorate the shaft to look like one. 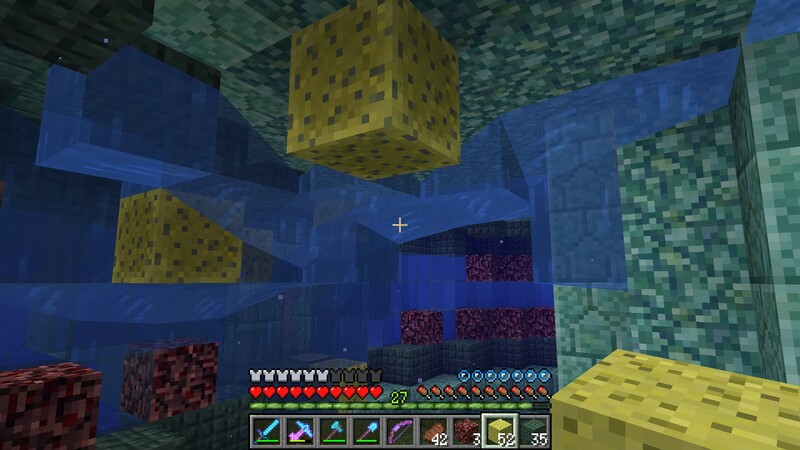 However, it would be fat better to build this in an existing ocean not generated in 1.13 - because they wouldn't be full of new and interesting aquatic features that all needed to be cleared, or magma shafts that would pull all the drowned zombies down a crevice from which there was no escape. So, rather than build the whole facility in a new Warm Ocean biome that would need to be stripped of all its kelp and coral, I thought I'd build the trident farm close to home, with the automatic kelp farm inside it - then, the rest could be built in an outpost in the Warm Ocean, where there might also be a turtle beach nearby. 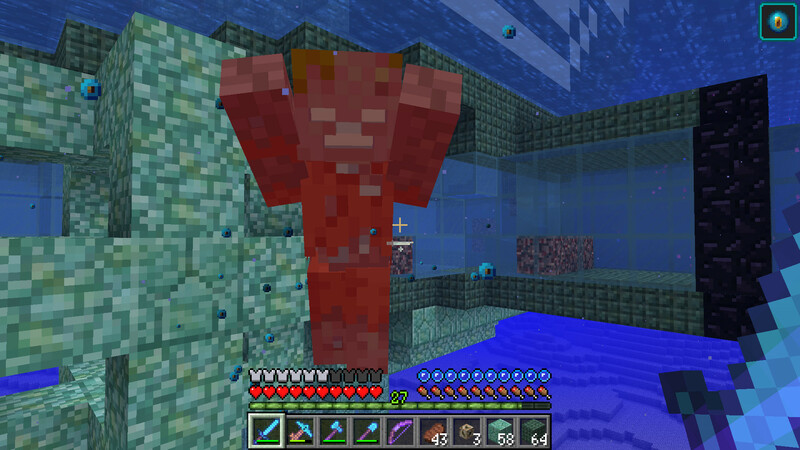 ...and will be spending the rest of his life in a tiny air pocket on the sea bed! I've made plenty of flat terrain so the drowned zombies can easily find their way to the central hub - where the soul sand will send them rocketing upwards to their eventual doom. 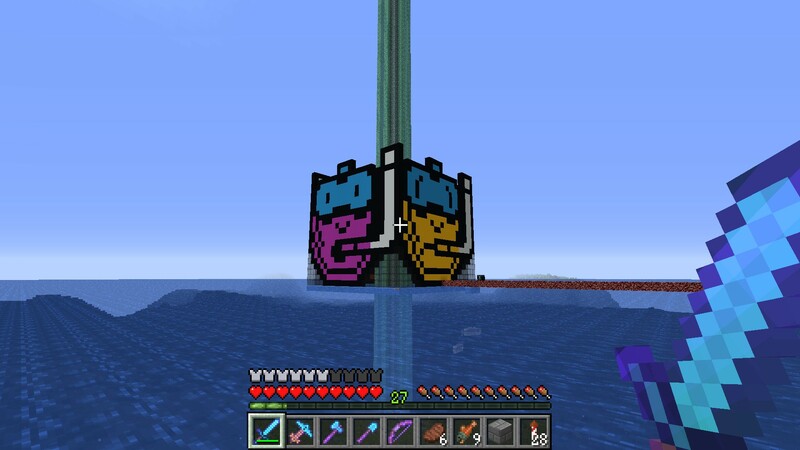 Looking at a cross section of the shaft that I've built up to sea level (making sure to cover over the soul sand for now), ilmango's original design involves only the glass - everything else is optional, such as the sea lanterns to light up the structure, and the prismarine blocks to make a Plotz-derived "circle" that's coloured the same way as a trident. Plotz will come in very useful in the later parts of this build! 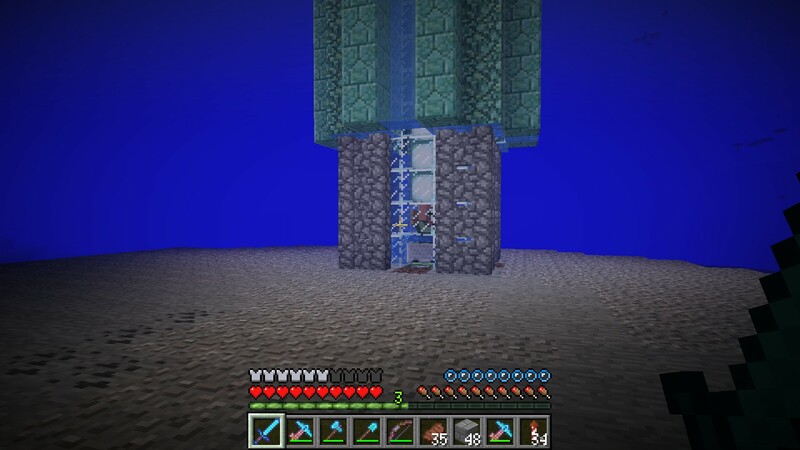 The water column for the trident farm had to reach a Y-coordinate of 156, to get far enough away from the sea bed that any caves underneath it wouldn't affect the spawn rates of the drowned zombies. Fortunately, this doesn't involve carting water buckets up to ridiculous heights, then dropping back down to the sea to collect more - ice cubes can be placed in the shaft and the sea lanterns will ensure they melt. 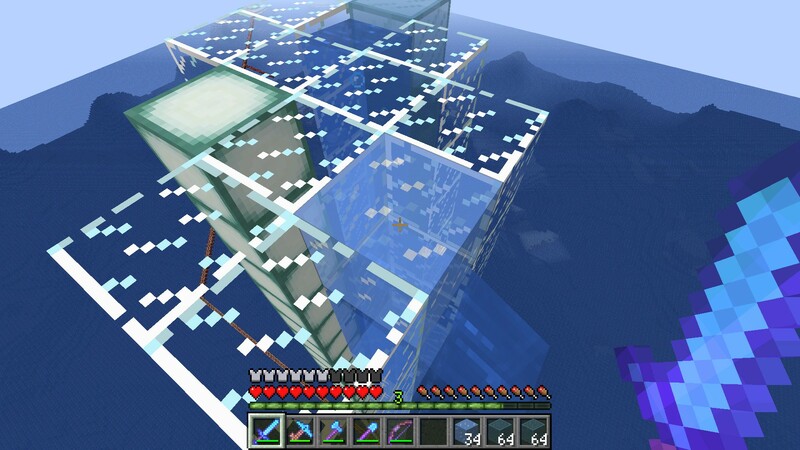 Seal it off with some cyan glass to match the outer prismarine blocks and the job's a good'un. 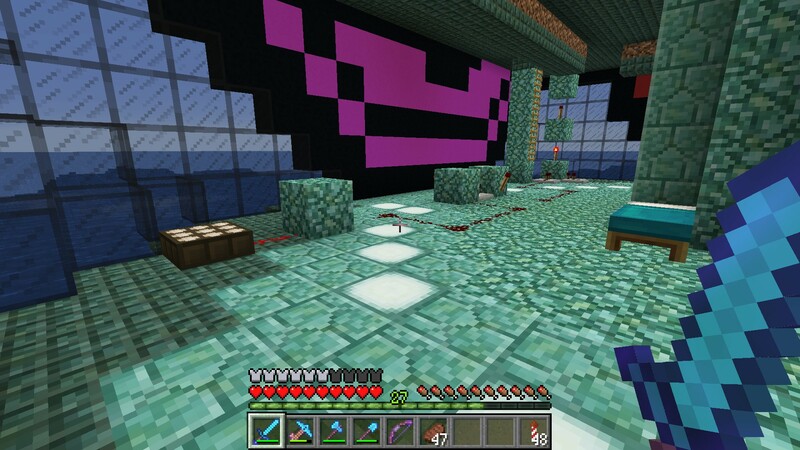 ...and here's the interior of the finished trident farm. 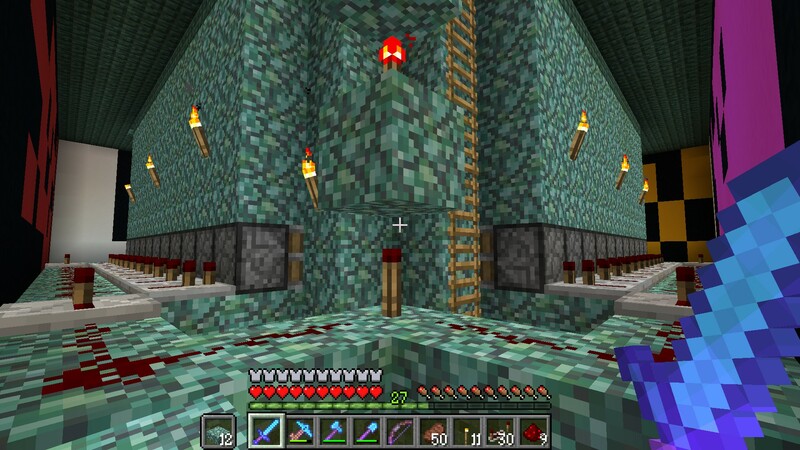 I've built a Nether portal to make it easier to access - there's room inside the central shaft to build a ladder, but there's no way out of it except right through the path of a horde of drowned zombies, or by adding an ugly appendage on the outside of the structure. There's only room for one chest, but I'll never be here long enough to fill it all in one session. 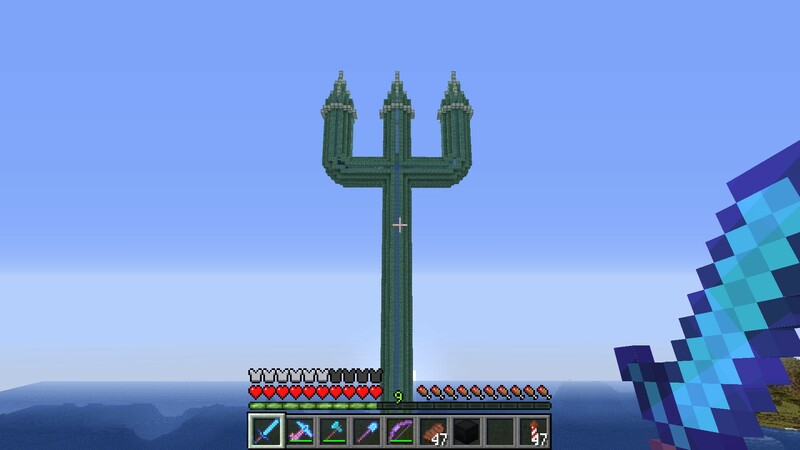 Meanwhile, on top of a pillar so the exterior design can be seen closer than from sea level, this is the trident design I've built, after a bit of trial and error. 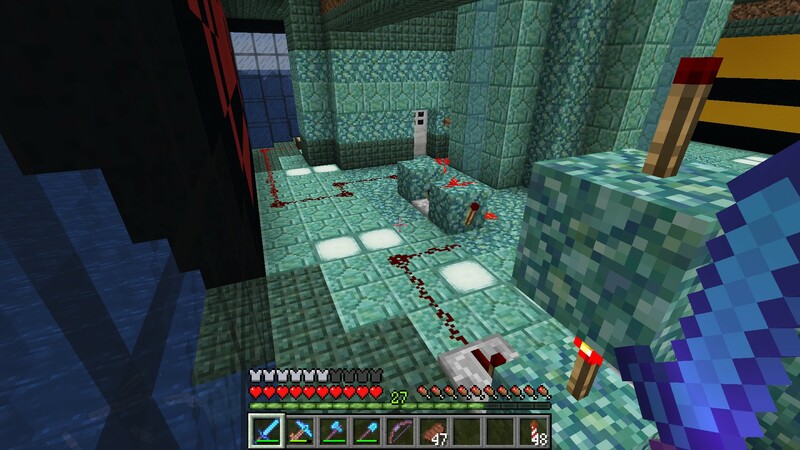 The left prong, as we see it, houses the drowned zombie killing cell and the portal, which is just about visible through the glass. The right prong is empty and is just there for decoration. The torus generator on Plotz was very helpful to get the bends in the prongs correct - each one is a quarter of a torus. Before I do anything else, I'm going on a conduit hunt. Something tells me these tiny orbs might at least make a useful decoration for the structure, even if I could never quite see their use during the snapshots. 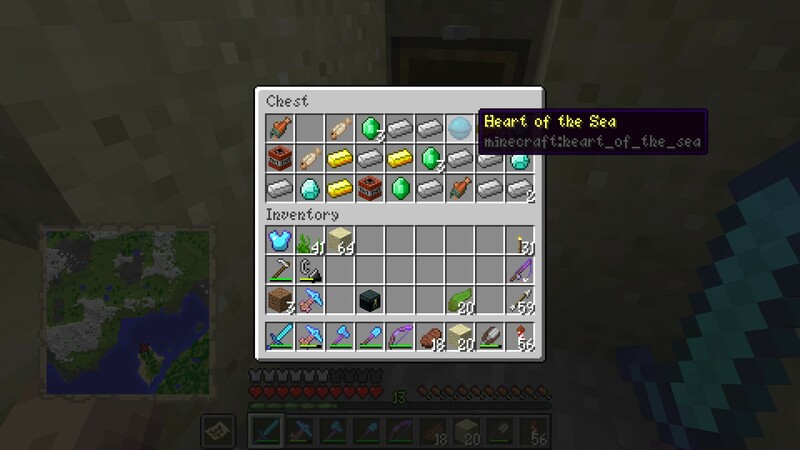 I've raided some underwater ruins, found myself this treasure map, and this island in front of me should have a chest buried in it containing a Heart Of The Sea. And, true to form, it does. Excellent. I will need three of these, and hopefully pick up a whole load more junk alongside it. It took a while, but I'm back at base - I found two Hearts Of The Sea in the initial area to the south of the base, then two more heading northwest towards the Warm Ocean that was part of my initial explorations in 1.13 to find turtles and harvest scutes. They're all for making into conduits. 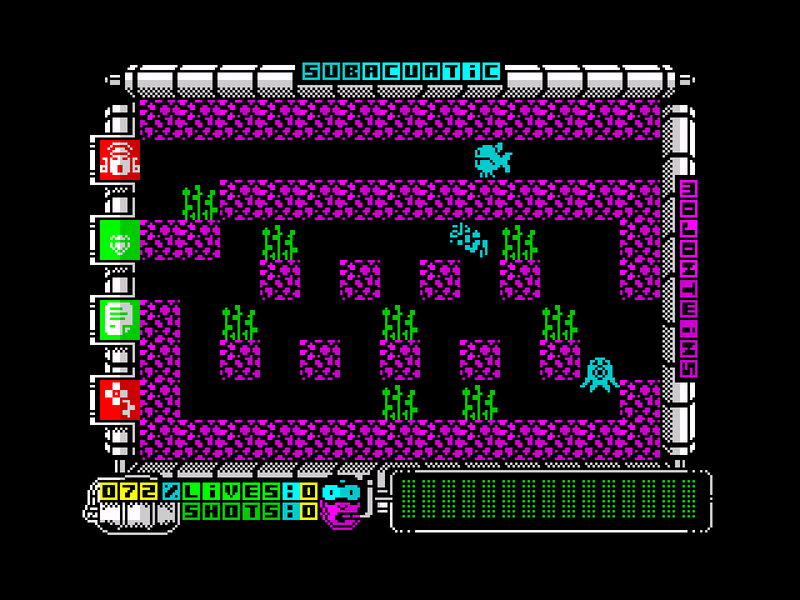 Watch this game completed by Pavel Plíva via the RZX Archive. 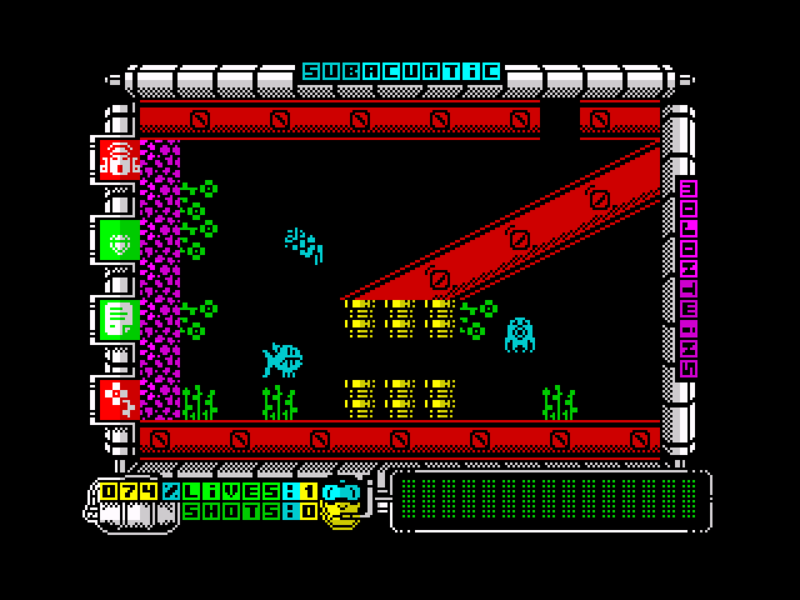 Subacuatic is a marvellous game from the "modern homebrew" era, from those heroes of the 21st Century Spanish Spectrum scene, the Mojon Twins. This was one of their first games from after Computer Emuzone had been dissolved and they'd started publishing via their own Ubhres Productions. It's a fairly simple maze game - "collect four treasures and return to the boat" - that isn't so hard that I get the impression I'd never finish it - I reckon I probably could, even on a real Spectrum with no do-over facilities, if I was very careful and had a map to refer to (which I do - cheers, Goodboy!). 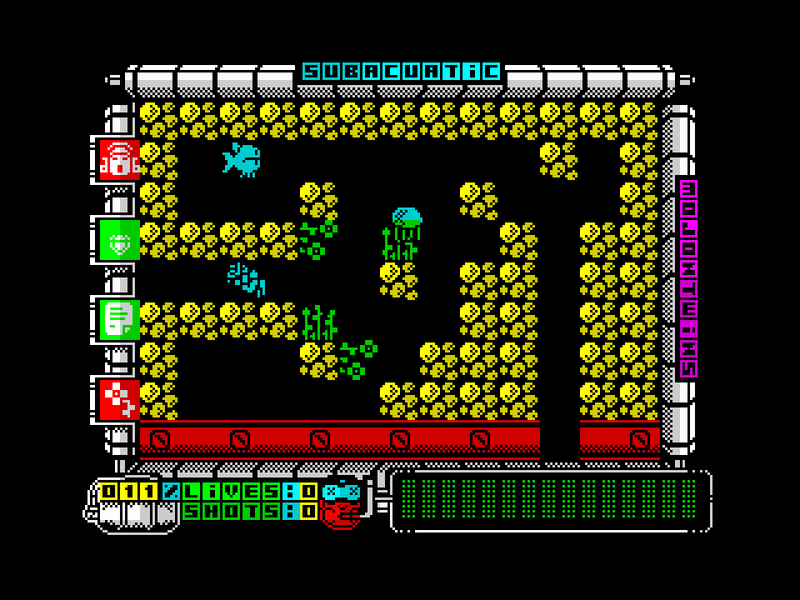 In this game, touching enemies or the green weeds that are forever in the way will drain your oxygen, which will be steadily ticking downwards anyway - if it reaches zero a life will be lost and the oxygen meter will return to 100% but there'll be no break in the gameplay, and no change in the face at the bottom of the screen. It only changes when there are no lives in reserve (extra lives are available shown as blue bubbles on the map) and the oxygen situation is getting concerning. The regular yellow one will change to the magenta "shocked" face at 75%, to the red "I'm drowning" face at 50% and the white "I'm dead" face at 25%. I've shown them all on the left. 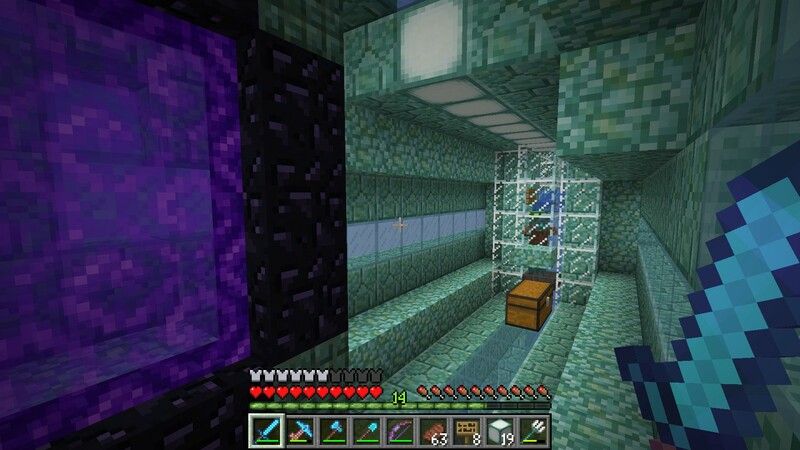 Effectively the game has infinite lives, as you can surface at any time to get your oxygen back to 100%, but the underwater caves are so deep and so long that this is not an option for the vast majority of the game. The diver flaps his arms and legs around while swimming, as much as a 16 × 16 pixel sprite can be expected to do, and there's a drifty-floaty "under the sea" type soundtrack to accompany your aquatic adventures. Here's a better view of the two "front" faces - the ones on the east and south sides that I'll see when I'm flying in from the base. There's still no good way to differentiate between the Spectrum's regular and bright palettes (given that coloured clay is more like looking at a Commodore 64) so I've made them a uniform colour, using concrete. Meanwhile, the "drowning" faces are on the north and west sides, which I'll only see if I'm coming back from a visit to the turtle beach. These are the faces you really don't want to see in the game! 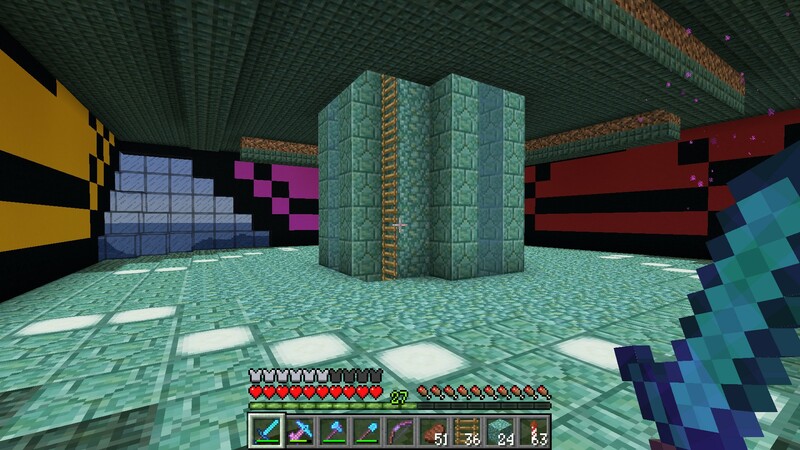 The kelp farm design is very simple; it's based on one xisumavoid built in the early snapshots, which allows a single line of kelp to grow in an isolated tank, where a row of pistons periodically cuts the stem just above the bottom layer so it can grow again. There's not a lot of room inside to move around or take screenshots - but I did plan the layout of the kelp farm beforehand in a spreadsheet so I'd know where everything was supposed to be, where the kelp tanks are, how high they can be, and how the redstone could fit around them. 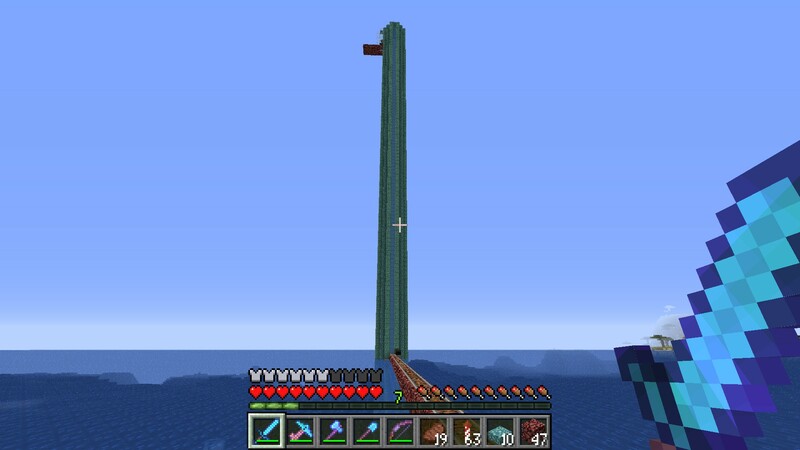 I found I could fit two layers of kelp tanks on top of each other if it was allowed to grow to a maximum of six blocks high. The fifth block is behind the hopper line, and the sixth block is one above it; the water from the sixth block flows towards the centre of the main structure, capturing the kelp in a hopper line. I've made the roof out of black glass so it (sort of) matches the black concrete outline of the faces. 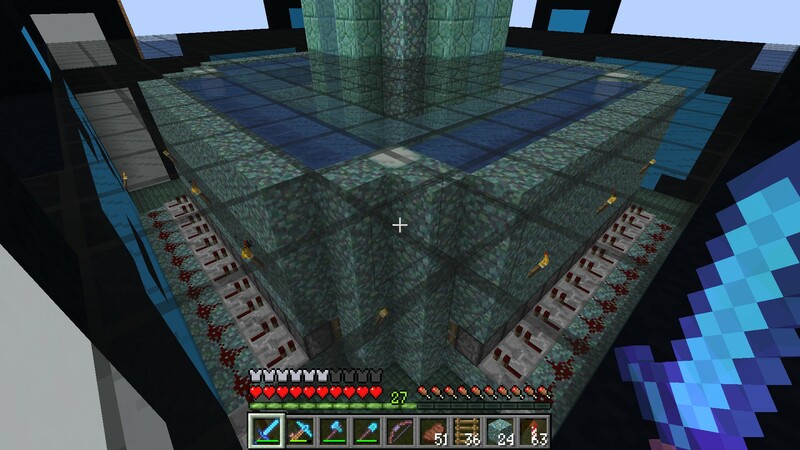 The redstone can be seen from here - turns out I didn't need that line of repeaters, but with 88 kelp plants constantly growing, it should get me a reasonable stash before too long. 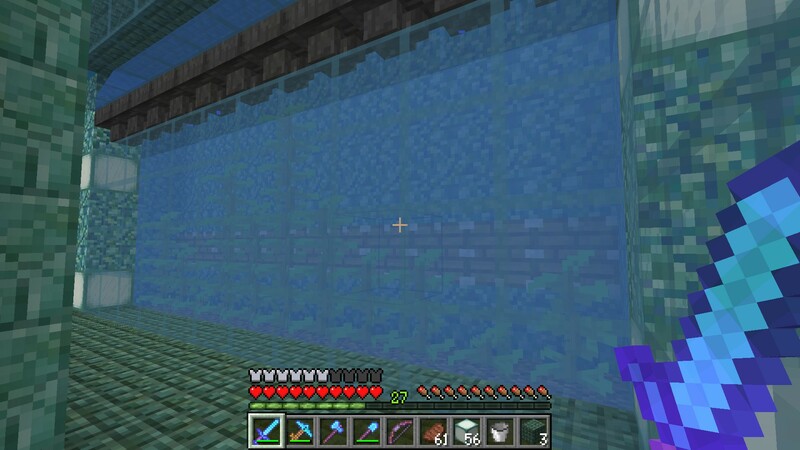 I'd built the kelp farm on a slightly raised floor that lined up with the widest part of the faces outside, with the floor built out of dark prismarine slabs that have helpfully been added in 1.13, so I get a half-block more headroom. This does mean that the stony soil I've planted the kelp on pokes through it - and I don't need the slabs underneath it any more, as I did when I was using sand - which I couldn't once I'd decided to build the second layer. 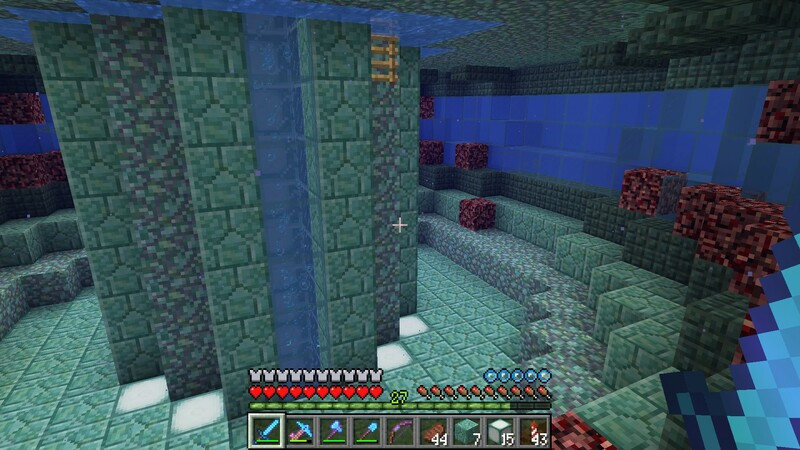 This area will be used for the redstone that harvests the kelp, and the collection area. ...along with a second sensor that pulses a monostable when the light level drops to zero. This ensures that, on a lengthy stay at this facility, the kelp will be harvested twice a day and shouldn't attempt to grow beyond the limits of the tanks. On the other side of the dividing wall that was hiding one of the redstone sensors is the collection area - simple but functional, and there's plenty of capacity - there are even a couple more double chests behind the wall between the end of the hopper line and this stack, so I should never run out of stock. 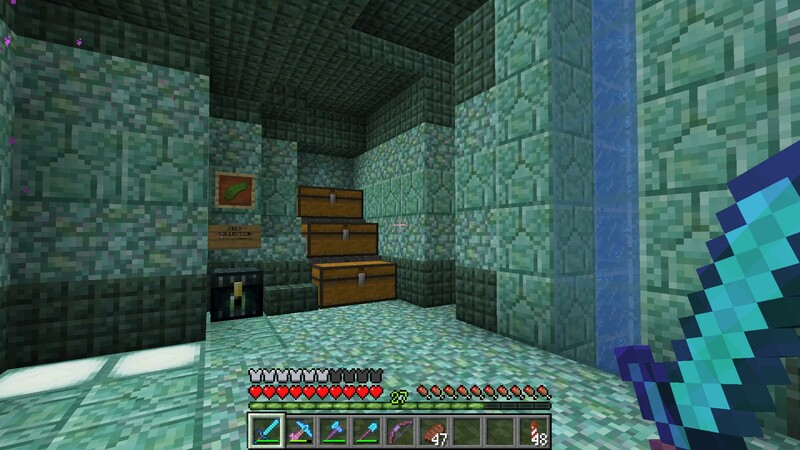 Originally, I'd intended for the "subacuatic" part of the build, below sea level, to be a sea grass and sea pickle production facility - but as these will be built elsewhere, it'll just be the entrance hall. I've built an inverted dome with some observation windows - and it's going to have to be relatively dark so it doesn't affect the spawning rates of the drowned zombies outside. 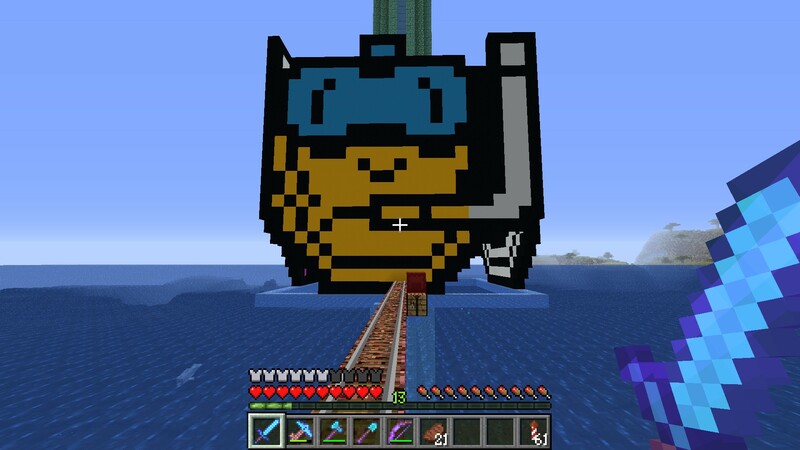 I'll clean up the scaffolding soon, it serves a small extra purpose for now. Those particles are destroying the drowned zombies with no input from me. This is clearly a bad idea, because I need them still alive... un-alive... still existing, anyway. Better take it down again. Bah. 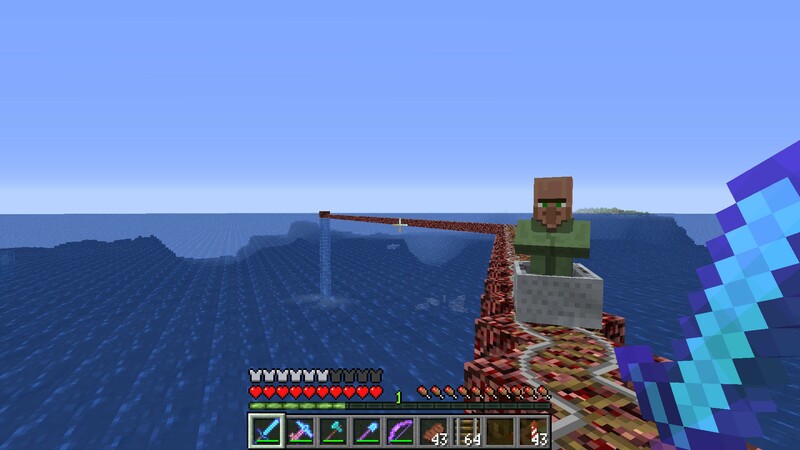 Annoyingly, I'd been hoping to build a second portal at the end of a tube sticking out into the sea, but couldn't get its equivalent in the Nether to synchronise - I suspect the Nether hub is so far up in the Nether (it's necessarily built near the roof) that the "nearest" overworld portal it finds is the sky-high one in the left prong of the trident, even though I've calculated the overworld X and Z coordinates perfectly. So in the end I had to make do with a manual entrance - a shorter tube with signs to create an "airlock"; ugly though they are, it needs to be three blocks wide. Then, I can put in an iron door, using a button instead of a pressure plate, so nasties can't get in. ...followed by filling the floor with slabs and a bit of lighting, and it's done. 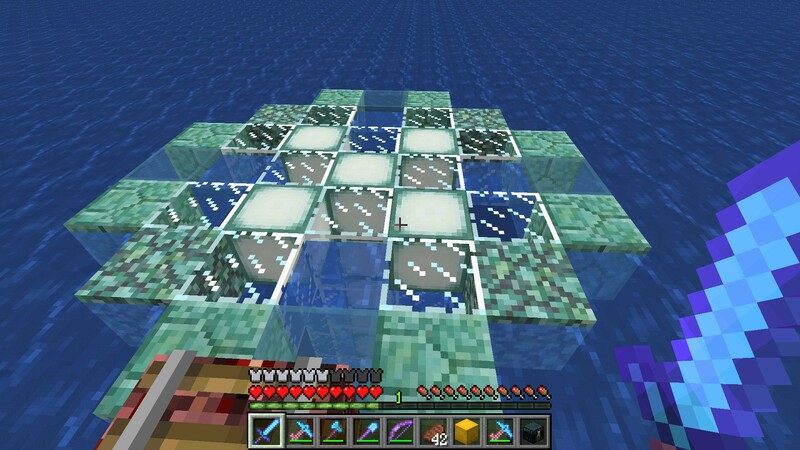 The position of the sea lanterns ensures a light level of 8 or 9 on all the dark prismarine blocks round the edge, stopping anything from spawning that I wouldn't want. The doors needed three pressure plates each rather than the one seen here, as the light level either side was only 5 - it was either that or put more sea lanterns in, and this was the simpler option. 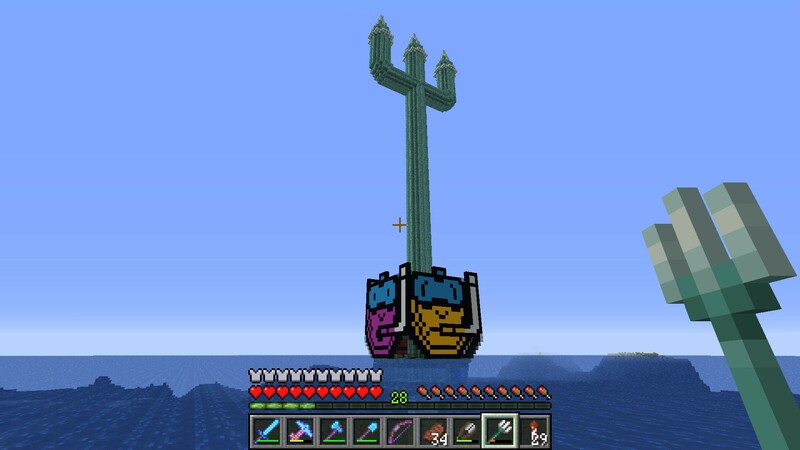 So here's the final build, seen from the ocean outside. I've got a decent supply of tridents now, and I've even picked one up from a brief visit to the farm in the left prong. Downstairs, inside the confines of the Subacuatic faces, the kelp is growing, which I can roast and turn into dried kelp blocks to build with. So, as I've said multiple times in this build, there has to be another facility somewhere out in the Warm Ocean. 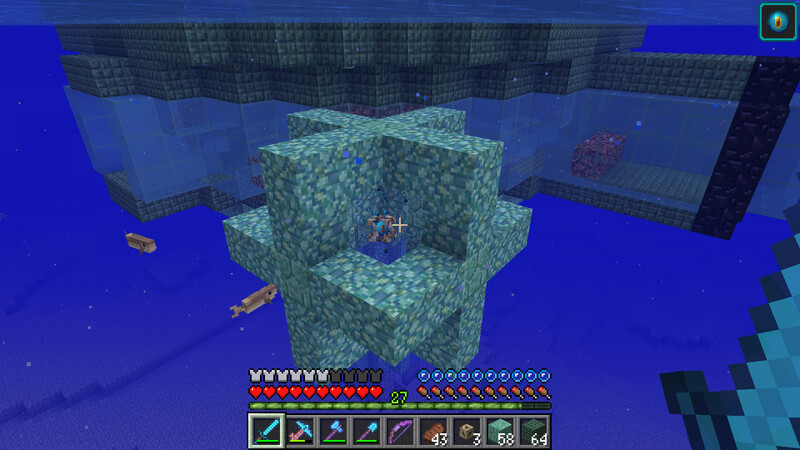 This will be Subacuatic Outpost, where I'll be able to grow sea pickles, sea grass and coral, and breed turtles. 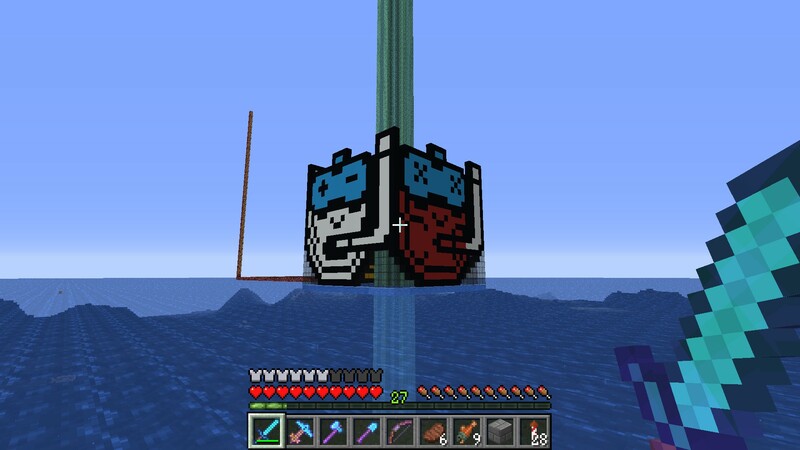 Then, alongside the venerable old 128K Guardian Farm and the rebuilt squid farm I'll have farmable access to every one of the renewable aquatic... I mean, acuatic items. It's just sponge and coral blocks that will remain non-renewable, but who knows if that will change?